The Spencer Smith range is based on the SSM plastic figures, many of which were originally designed by Holger Eriksson. They were and are designed with the beginner in mind (or the seasoned wargamer who is beginning again!). The figures are basic, exactly to scale, lacking in fine detail but easy to paint, all of which is reflected in the very reasonable price that we charge to suit all budgets. These rules have been extracted, with permission, from Donald Featherstone’s famous book “War Games” – the one that started it all. £5.95 + p&p. After making your purchase via PayPal, you will be taken to a new page where you can click on the link to download your PDF file (approx 13Mb as it has been scanned in from Don's original typewritten sheets). 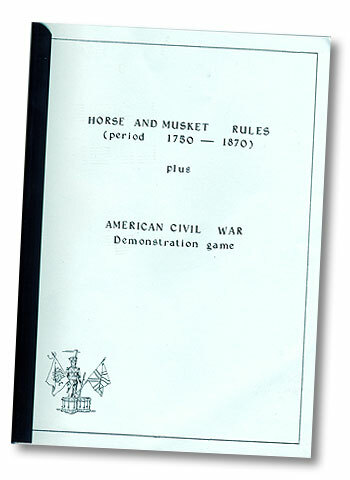 by Clive Jebbett, ideal for use with our Shiny Toy Soldiers, producing a fast-flowing and fun game, includes card playsheet.